Cathay Pacific has said it will honour first-class and business-class tickets that it sold to some lucky passengers for a fraction of the usual price. The Hong Kong-based airline mistakenly sold business-class seats on August flights from Vietnam to New York for about $675 return. Prices on the same route in July and September cost $16,000. The airline admitted that it “made a mistake”, but said it would honour the tickets. The fares were reported by travel bloggers on 31 December and later withdrawn by Cathay Pacific. Mac Jaehnert, from Milwaukee, Wisconsin was alerted to the bargain prices on Twitter and seized the chance to book a first class ticket from Boston to Hong Kong, and an onward flight to Hanoi in business class for a total of $1,220. He had always dreamed of having a first class ticket, he told the BBC, but as a travel blogger and social media manager for a tech company, he usually travelled in economy class. “When I did the math, what I paid is at about a 95% discount,” he said. He was relieved to hear that the airline would be honouring the tickets. It was not clear how many tickets had been sold and Cathay Pacific did not immediately respond to requests from the BBC. The mistake concludes a challenging 2018 for Cathay Pacific, as it tries to return to profitability after posting its first ever back-to-back annual loss in March. 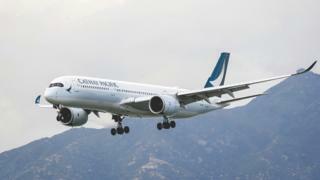 In October, Cathay Pacific was the subject of a data breach in its IT systems, jeopardising the personal information of up to 9.4 million passengers. A month earlier, it had to send one of its planes back to the paint shop after spelling the airline’s name “Cathay Paciic” on the side of the jet. Airlines often honour tickets sold in error, but practices differ from carrier to carrier and according to circumstances. Singapore Airlines, for example, honoured tickets sold for less than half price in 2014. United Airlines cancelled transatlantic tickets sold for less than $100 by a “third party software provider” the following year.